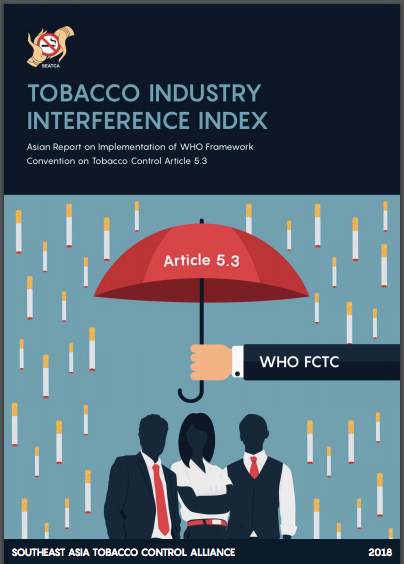 This first Asian Tobacco Industry Interference Index provides an overview of how 14 countries are faring in implementing the WHO Framework Convention on Tobacco Control (FCTC) Article 5.3 guidelines. 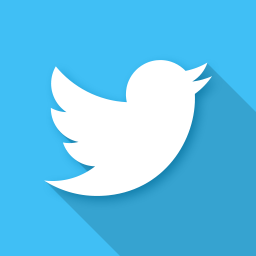 The Index is based on publicly available evidence to support choice of scores. Overall findings indicate that most countries are moving at a glacial pace in implementing Article 5.3. While some countries have made progress in reducing interference from the industry, others have remained stagnant or regressed. There still remains much room for improvement in Asia in the implementation of Article 5.3 guidelines. The Index aims to generate discussion and facilitate action to counter tobacco industry interference that undermines and delays tobacco control efforts at the country level. 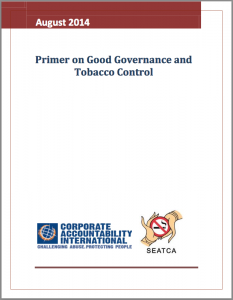 This document makes the case for why tobacco control policies, particularly those aimed at protecting public health policymaking from the tobacco industry are, in reality, good governance policies geared towards fighting corruption. It is intended for advocates and governments around the world to give them additional tools to be able to implement the life-saving measures enshrined in the global tobacco treaty, formally known as the WHO Framework Convention on Tobacco Control (FCTC). The UN Sustainable Development Goals (SDGs) of the 2030 Agenda for Sustainable Development adopted by world leaders in September 2015 requires governments to mobilize efforts and partner with different stakeholders to end all forms of poverty, fight inequalities and tackle climate change while ensuring that no one is left behind. The Tobacco industry (TI) takes advantage of the SDGs to reach customers through the so-called Corporate Social Responsibility (CSR). The industry claims that CSR activities are implemented in accordance with the SDGs while its business is in conflict with almost all the SDGs. 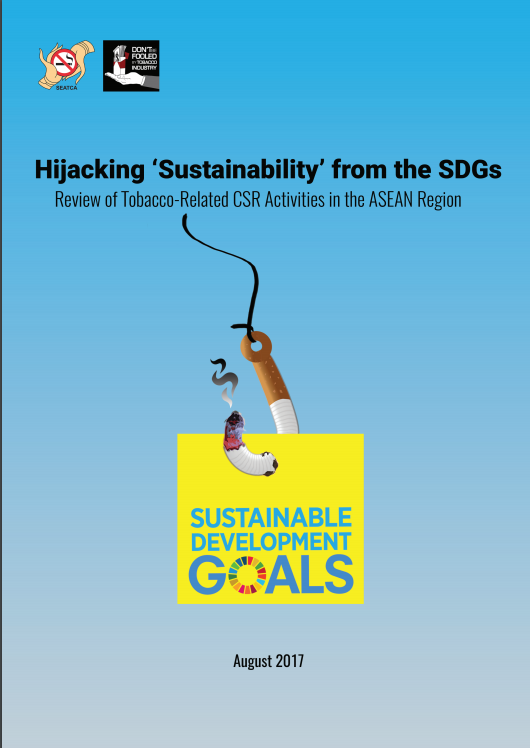 The report provides comprehensive information about the tobacco industry’s tactics in utilizing the SDGs as a license to damage health and life of people, hijack sustainable development policies and undermine public health policies in the region. It also discussed on TI’s investment under the name of charitable contributions and new tactics of TI to reach children and young people. 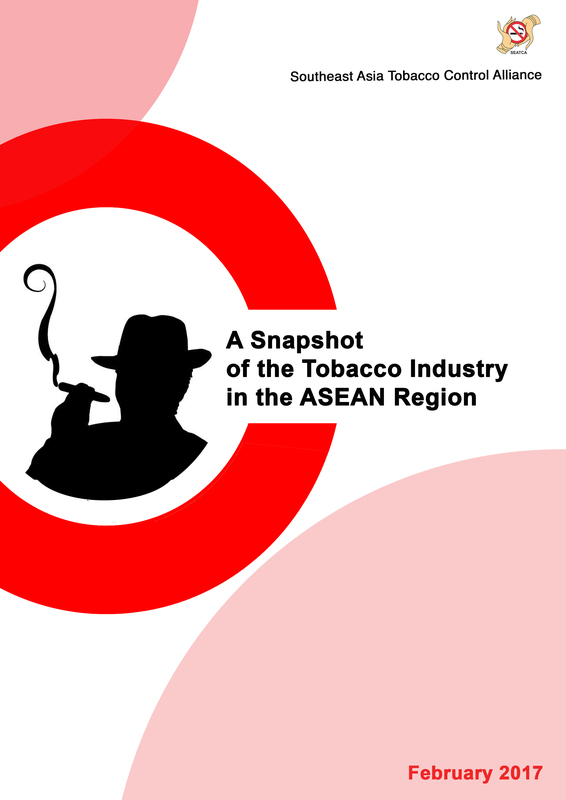 This snapshot provides quick facts on the main tobacco companies operating in the region. 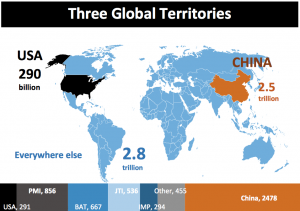 The world’s top three companies have a strong presence. 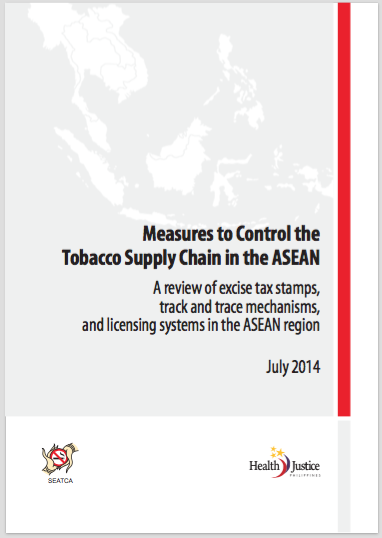 Cigarette sales in ASEAN countries are set to increase between 2015 and 2020 in almost all the countries. 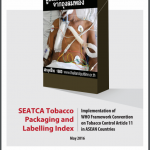 This toolkit presents a range of issues, policy options, and considerations that each country needs to take into account when implementing Article 5.3 of the World Health Organization Framework Convention on Tobacco Control (WHO FCTC). It describes guiding principles, common practices and motives used by tobacco industry in interference; steps for effective Article 5.3 implementation as well as illustrates recommendations for implementing Article 5.3 and some policy templates are included. The global action against the tobacco industry is also presented. The role of IOs, including non-government organizations (NGOs), needs to be examined in the context of a multi-sectoral approach. The actions of these organizations influence state behavior, help transform the processes of international law, mobilize states, and leverage public opinion. 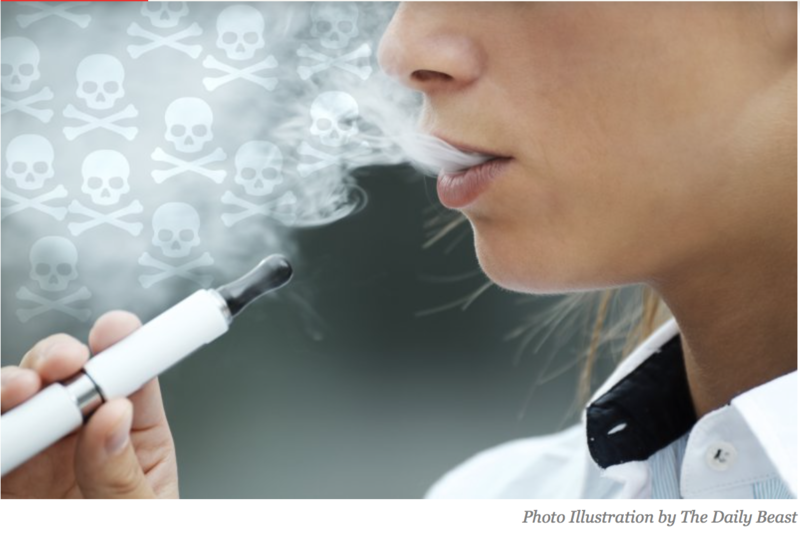 Needless to state, IOs play a critical role in increasing awareness of the tobacco industry’s practice of using front groups to further its interests. Tobacco companies continue to conduct fake CSR as a tactic to undermine the ban on tobacco advertising, promotions and sponsorship. To circumvent the ban, they use their own foundations to fund and advertise these activities. 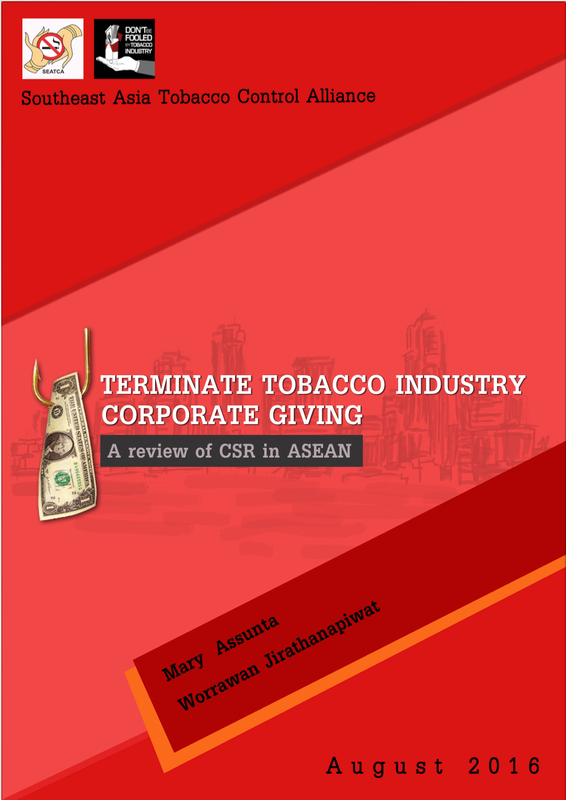 This report provides the latest information on which organisations in the ASEAN region the top 4 tobacco companies have targeted to front their so-called charities. 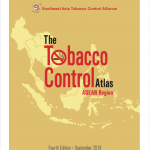 Except Brunei, all countries in the ASEAN region have an American Chamber of Commerce (AmCham) country chapter that has increasingly become a champion for the tobacco industry. 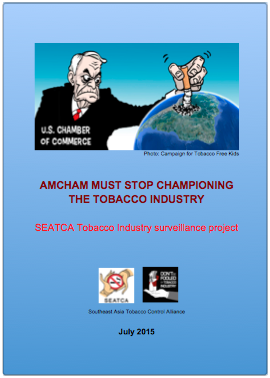 With governments in South East Asia enacting strong regulations and curbing promotional activities of the tobacco industry, AmCham has stepped in to become one of its voices and conduct activities promoting the tobacco industry. The tobacco industry has found a strategic ally in AmCham because it is a high profile business institution, well regarded by governments, is in the forefront of activities involving high-level US state officials’ visits to Asia, and has close relationships with US ambassadors in various countries. Consequently, it has access to top Asian government leadership, thereby making it an ideal avenue for the tobacco industry to promote itself. The U.S. Chamber of Commerce, having close ties to the tobacco industry, has been actively derailing tobacco control regulations and undermining life-saving policies in dozens of countries around the world, according to a new report released by a coalition of public interest and health groups. 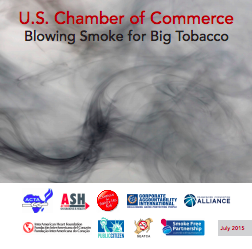 The report, Blowing Smoke for Big Tobacco, details how the U.S. Chamber of Commerce (U.S. Chamber) has helped the tobacco industry fight tobacco control policies in many countries, including in Asia, undermining measures intended to combat a global tobacco epidemic that remains the number one preventable cause of death. 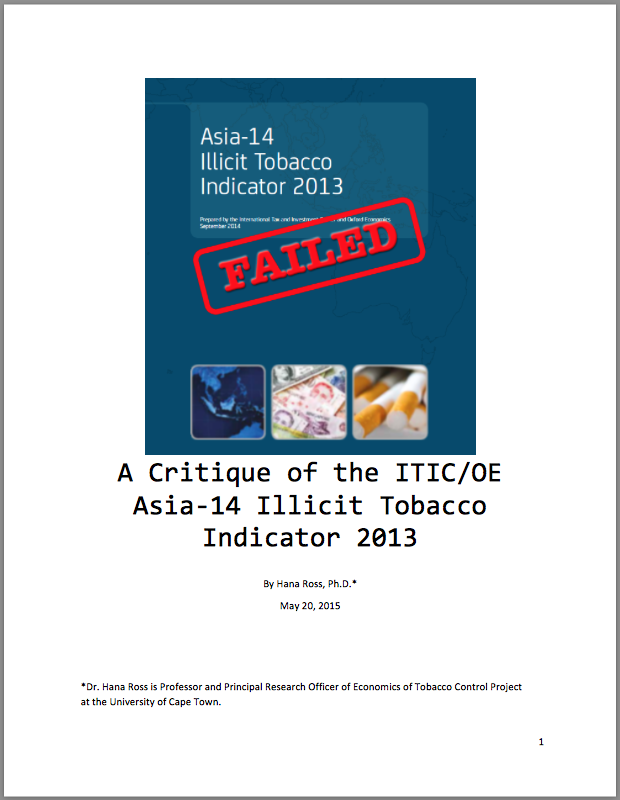 This is a critique of a Philip Morris International funded study on illicit tobacco trade,The Asia-11 Illicit Tobacco Indicator 2012, conducted by the International Tax and Investment Center (ITIC) and Oxford Economics (OE) released in September 2013. 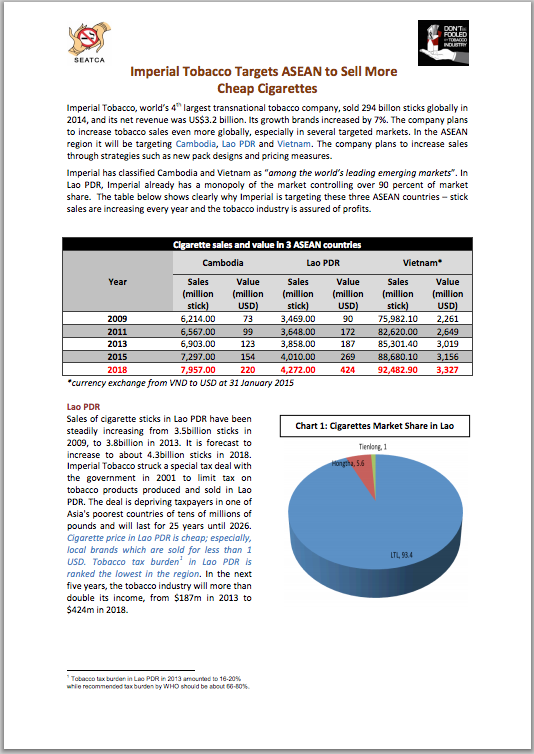 This Asia-11 report, while claiming to be done by independent researchers, was prepared according to terms of reference provided by Philip Morris Asia Ltd, while the ITIC itself is funded by the major transnational tobacco companies. The main conclusions of the report echo the assertions of tobacco companies, such as countries with high taxes on tobacco also had the highest volumes of illicit cigarettes. 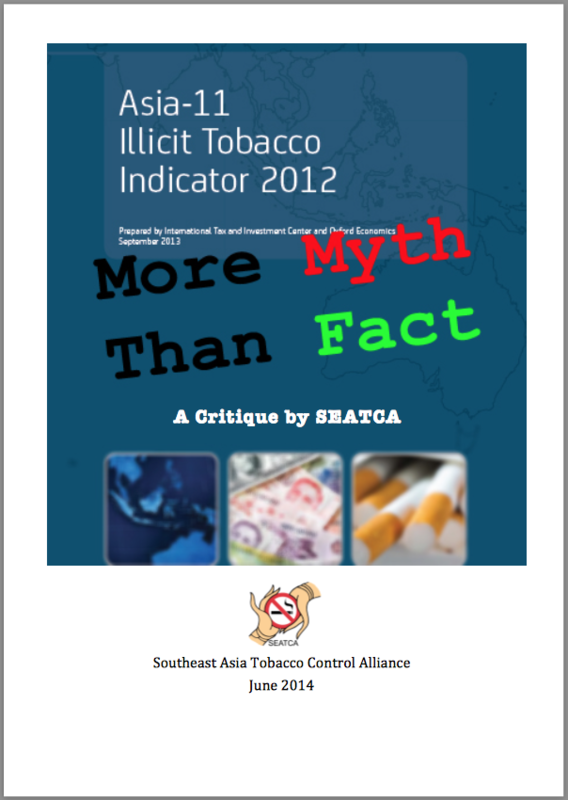 The Southeast Asia Tobacco Control Alliance (SEATCA) has stamped Failed on a tobacco industry funded research on illicit trade of tobacco products in 14 Asian countries. 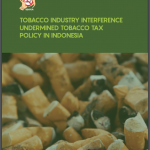 The research, entitled Asia-14 Illicit Tobacco Indicator 2013 (Asia-14) was published by the International Tax and Investment Center (ITIC) and Oxford Economics (OE) last year. This is a follow up to their previous attempt to estimate the scope and composition of illicit tobacco consumption in Asia presented in Asia-11 Illicit Tobacco Indicator 2012 (Asia-11). 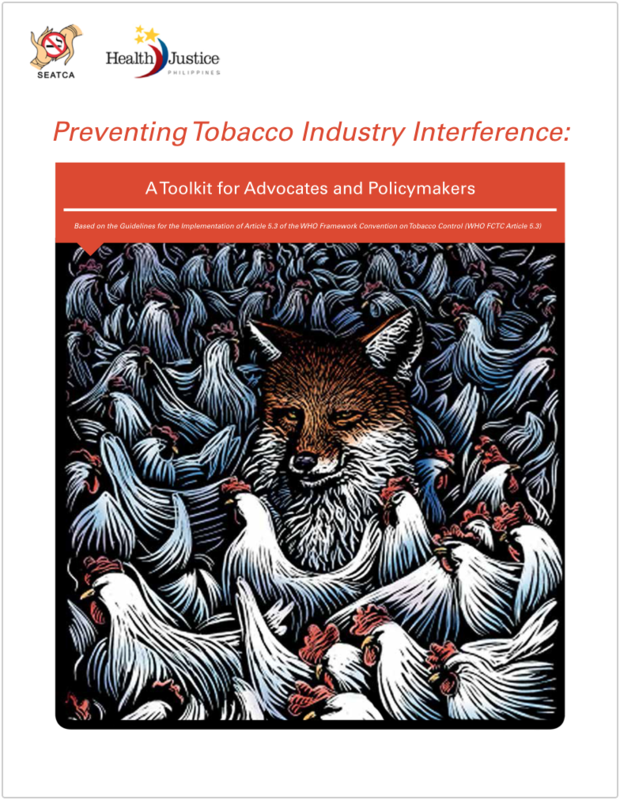 This primer makes the case for why tobacco control policies, particularly those geared towards protecting public health policymaking from the tobacco industry, are, in reality, good governance policies. It is intended for advocates and governments around the world to give them additional tools to be able to implement the life-saving measures enshrined in the global tobacco treaty, formally known as the World Health Organization Framework Convention on Tobacco Control (FCTC). The ISO 26000: Guidance on Social Responsibility is the most comprehensive standard related to social responsibility. However, current practices of TI fail in all principles of ISO 26000, making it impossible to be considered as socially responsible industry. 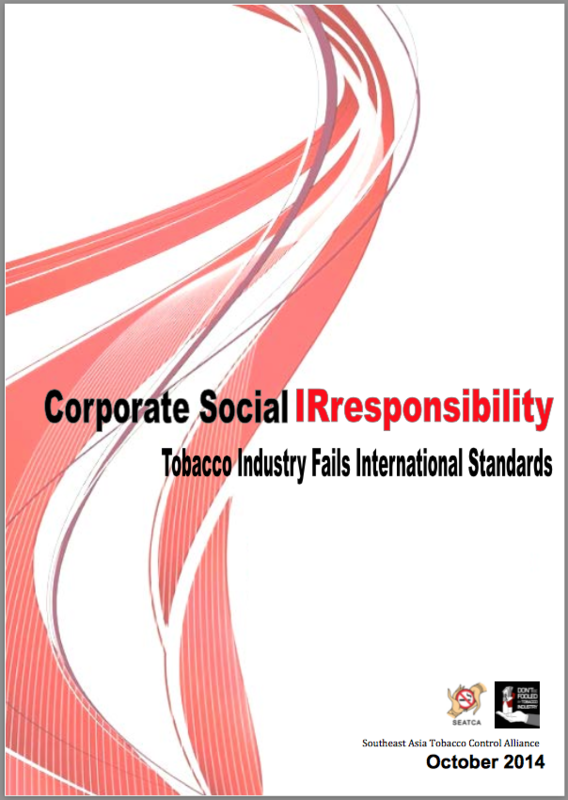 This report provides details how TI-CSR fails in all principles and core subjects of ISO 26000 as well as recommendations to stop TI-CSR. Tobacco companies are increasingly resorting to corporate social responsiblity (CSR) activities to continue their promotion to buy goodwill and credibility to earn political mileage. 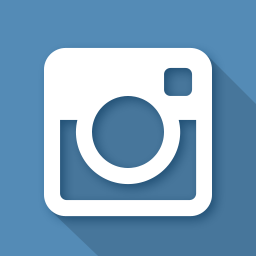 CSR is a form of sponsorship, which amount to promotion hence should be prohibited. CSR must be address as part of denormalisating the tobacco industry. Imperial Tobacco, world’s 4th largest transnational tobacco company, sold 294 billon sticks globally in 2014, and its net revenue was US$3.2 billion. 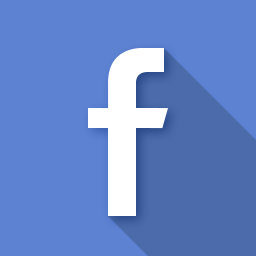 Its growth brands increased by 7%. The company plans to increase tobacco sales even more globally, especially in several targeted markets.In the ASEAN region it will be targeting Cambodia, Lao PDR and Vietnam. The company plans to increase sales through strategies such as new pack designs and pricing measures. Imperial has classified Cambodia and Vietnam as “among the world’s leading emerging markets”. In Lao PDR, Imperial already has a monopoly of the market controlling over 90 percent of market share. The table below shows clearly why Imperial is targeting these three ASEAN countries – stick sales are increasing every year and the tobacco industry is assured of profits. 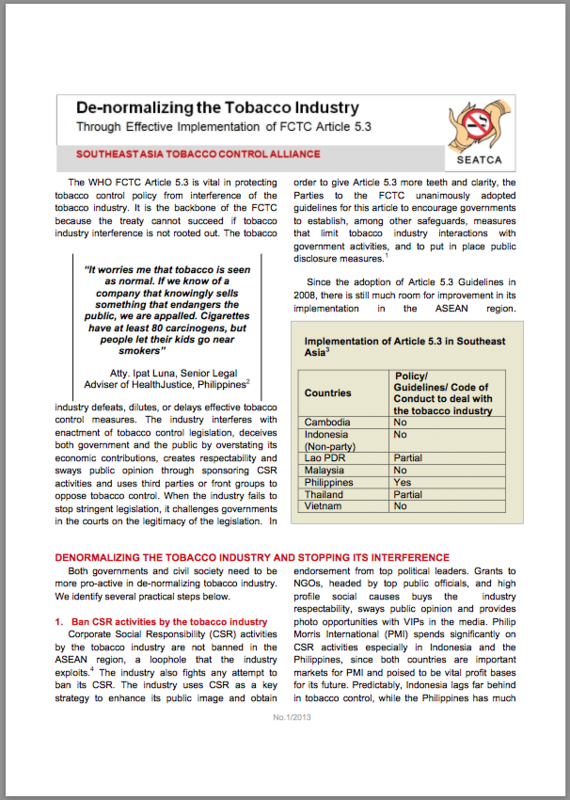 The WHO FCTC Article 5.3 is vital in protecting tobacco control policy from interference of the tobacco industry. It is the backbone of the FCTC because the treaty cannot succeed if tobacco industry interference is not rooted out. 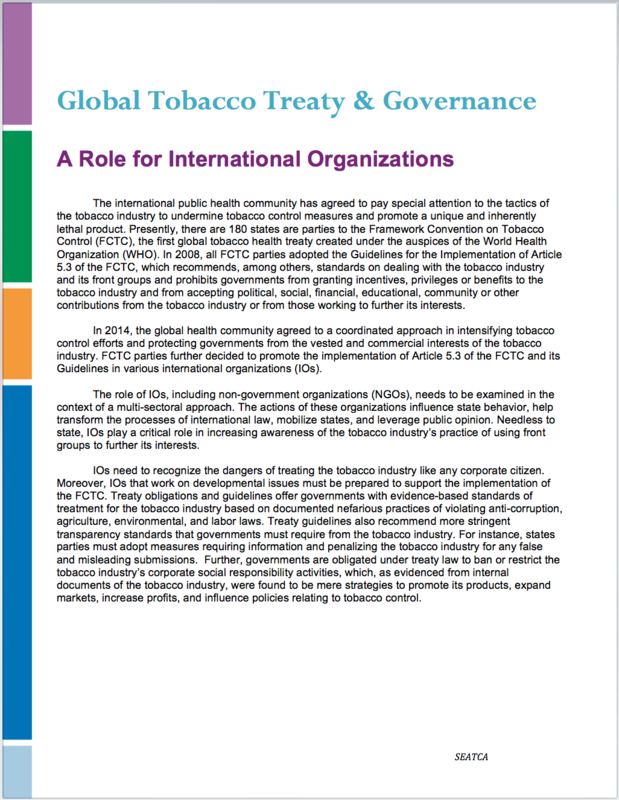 In order to give Article 5.3 more teeth and clarity, the Parties to the FCTC unanimously adopted guidelines for this article to encourage governments to establish, among other safeguards, measures that limit tobacco industry interactions with government activities, and to put in place public disclosure measures.